With nearly six out of 10 Miami households living in or on the edge of poverty, according to our United Way ALICE Report, helping people pave a path to a better future is essential. That’s why we’re focused on empowering hard working individuals and families with the tools, training and opportunities to prosper economically, including everything from financial coaching to employment services to debt management and asset building assistance. 20 programs at United Way Impact Partner agencies that help people meet basic needs and create pathways to financial stability through attaining better employment, increasing income and financial literacy, and building savings and assets. Working with Branches, Catalyst Miami, City of Miami and FIU, we are increasing the community’s capacity to provide more financial coaching to families living on the edge through the Miami-Dade Financial Capability Collaborative. 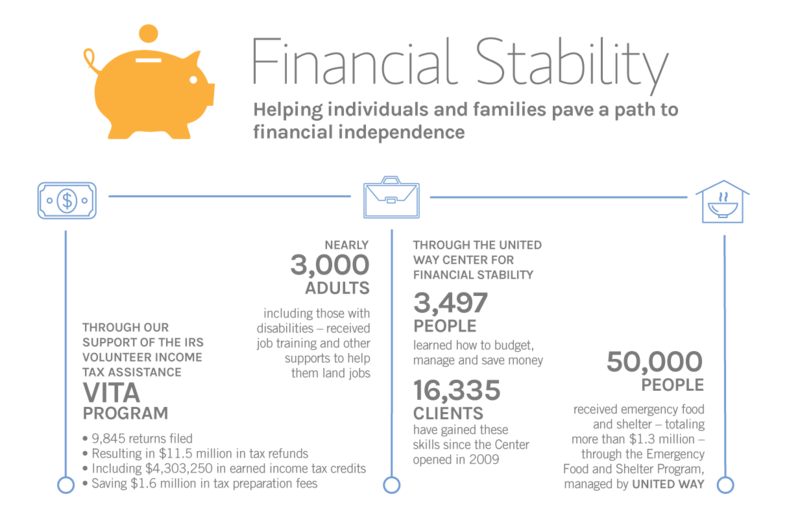 At the height of the economic downturn, in 2010 we opened the United Way Center for Financial Stability to provide working individuals and families with a full range of services and support to improve their financial status – and opened a second site in 2014. Through a partnership with Miami-Dade County’s Council for Prosperity Initiatives and more than a dozen financial institutions – Bank On – we are connecting low-income families with safe and affordable financial products and solutions. To help veterans re-acclimate to civilian life, we launched Mission United, connecting veterans and their families with essential services and employment opportunities, with a particular focus on post 9/11 veterans.